Lesson learned, I should trust my own instincts. Back in May there was tremendous excitement when Bill and Ted Face the Music was officially confirmed by MGM. Fans had been waiting decades for Keanu Reeves and Alex Winter to rock on for a third film, despite all sides wanting to return and a story long having been in place. And now comes word from Keanu himself the sequel may have already been unplugged. Speaking with Yahoo, Reeves cautioned the film may not happen at all. The reason he gives have nothing to do with the story, but the stuff that actually kills projects all the time: boring legal and rights issues. Ehhhh, that's not good. Bill & Ted 3 has faced a long hard road, and it sounds like the same issues that have always plagued it are still there. Don't hold your breath on this one. 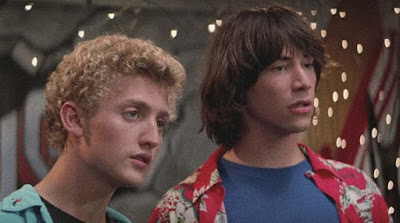 If it happens, Bill and Ted Face the Music will be directed by Dean Parisot with a script by franchise creators Ed Solomon and Chris Matheson.